Modern take on an ancient design now used by the Philippine Marines. 5160 Spring Steel blade. From it’s classic form as an agricultural implement, used to cut and strip sugar canes, and clearing rice fields, come a Utility, Survival and Tactical blade adapted and modified as a more robust implement called the Tactical Ginunting. It is part of the Philippine Marines’ arsenal, used in clearing vegetation when cruising the jungles, dressing hunt, preparing firewood, and for self defense. The combination of plain and serrated edge blade makes it formidable for self defense and close quarter combat. 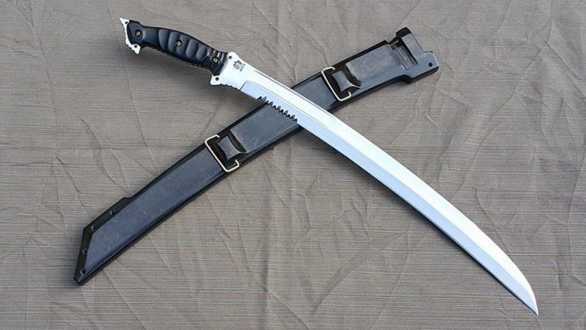 Its well balanced and aesthetically designed blade and sheath. The blade is made from 5160 High carbon steel, selectively tempered to withstand daily use. Near the guard of the blade is a 3-inch serrated edge, a small saw which is great for cutting ropes, fabric or leather. The combo edge blade adds to the aesthetic look and versatility of the blade. This combination of a plain and serrated edge blade makes it a multipurpose long knife for hunting and or clearing path across forested areas or thick bushes. It also has a sharpened false edge. HANDLE: Beautifully hand curved ” Kamagong” or ebony Slabs designed for comfort and ease of holding the blade. It is secured with screw and nut, and further mended with special epoxy to reinforce the full tang metal grip. SHEATH: Mahogany wood, Kiln and aged and coated in black; Side liner quick draw sheath with forced fit locking system and a band ring for sling straps for either leg, front, side, and back carry. As BCI is a traditional sword forge, they do not mass produce their blades - so the time between restock can be many months. 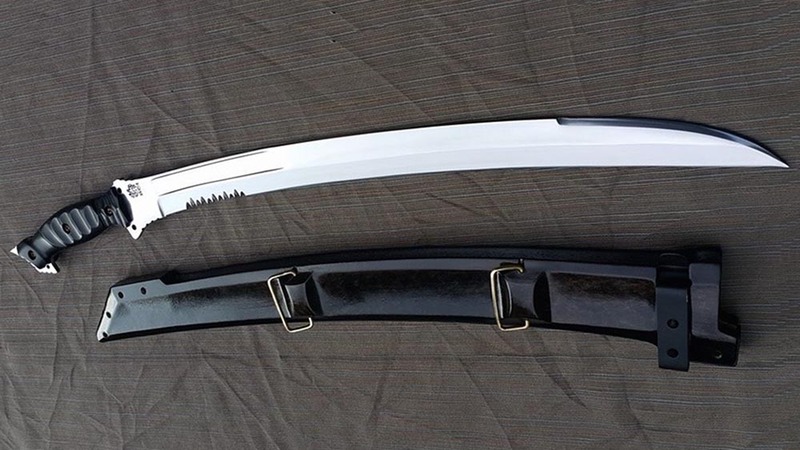 As these swords are in very limited supply and priced well below usual industry markups, it is highly recommended that if you want to secure one and they are in stock, you order as soon as possible to avoid disappointment. 5160 Spring Steel Sharpened Blade with False Edge and Serrated edge near the guard. 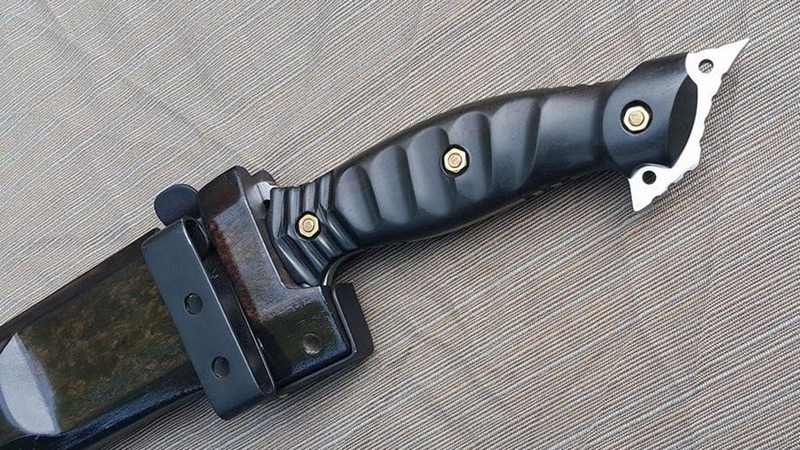 Ebony Wood Handle. Mahogany Wood Leather covered quick draw scabbard with locking mechanism. Premium Quality Construction. I received my Ginunting today and I'm very impressed. The sheath is also decent although i do prefer kydex. I'm still not disappointed. You can enhance the speed release on the sheath with a simple paracord turk knot - doesn't need it but for those that know, why not? What stands out for me is the symmetry on the grind - no burrs or chips and the back edge is done properly. The handle slab alignment fits flush and the edges are rounded. The file work is really nice too - the jimping and contours makes control and grip transitioning very easy. I had a custom Ginunting made by Jim Erikson over a decade ago and I prefer this new one. For a rough comparison - in the hand i feel that this has got as much integrity as my Swamp Rat Rucki - it wants to chop all day long. Thanks SBG for giving me the opportunity to add this to my collection.